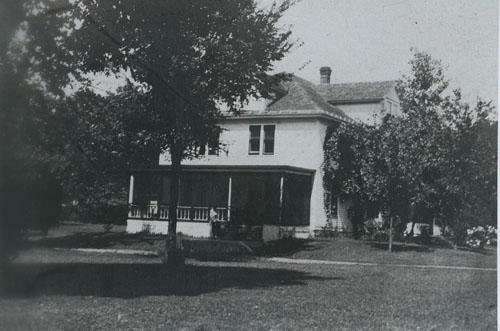 Before 1887, much of what became St. Paul Park was farm fields and pastures in Newport Township. Joseph Hugunin, R. S. Snow, and William and Giles Fowler were among the earliest settlers. William Fowler, a successful stockman, sold his farm in 1887 to the St. Paul Park Improvement Company for about $80,000 for a townsite. According to the company’s promotional piece, the village was platted, the first house was erected and the first sale was made in June of 1887. By 1888 the village had a post office and a population of some 1,200, with graded streets and sidewalks laid, over 200 residences, a hotel, numerous stores, churches, and schools. It boasted “twelve flourishing manufactories in successful operation” located on its private railroad tracks. A cash bonus of $100 was given for each workman employed and land on the sidetrack was donated to any manufacturing concern that would relocate. In a few years the factories included the St. Paul Knitting Works, Dewey Harvester Works, Globe Engine & Boiler Works, the Black Hawk Mills, a terracotta factory, a baby carriage and rattan factory, a silk works, three sleigh and carriage factories, a cart maker, car shops, a sash and door factory, broom factory, mattress factory, excelsior mill, lumberyard, and a host of other companies employing more than 1,000 workers. The village was served by two railroads: the Chicago, Milwaukee & St. Paul and the Chicago, Burlington & Northern. The latter road had a spur that served the factories, running along the north end of the community. Depots were located at Broadway and Pullman Avenues, and a steamboat landing at the foot of Broadway. With so many factories in town, a shortage of local workers existed. Laborers were heavily recruited from St. Paul. To facilitate commuting, the railroad ran a special commuter train, called the Burlington Motor from St. Paul to St. Paul Park. Trains ran on the hour with extra cars put on the morning and evening trains for commuters. The ride took only 25 minutes and cost just 6 cents fare. The Motor ran through the 1920s. In its heyday of the 1890s the town had many boarding and rooming houses. The best hotel in town was the Parker House, named for developer Charles Parker, located near the Broadway Depot. A two-room school was built in 1887, which had to be expanded in just two years to accommodate 300 students. A high school, the St. Paul Methodist College, ran from 1890 until 1918 when it closed because of dwindling enrollment due to young men being drafted for World War I (and perhaps from anti-German sentiment). In the early days there were three Protestant churches, and in 1900 the St. Thomas Catholic mission church from Langdon was rolled overland into the Park. St. Paul Park was a boom town for a decade, but soon the money ran out. The panic of 1893 put an end to many ambitions. The city lost industries; many idle factories burned, and the work went elsewhere. In 1908 the sheriff was obliged to sell over 4,000 lots at auction to satisfy debts. In the twentieth century the village started to grow again. Several small businesses located on Broadway and Second Streets. These included a blacksmith, livery stable, confectionery, three grocery stores, a doctor’s office, and bakery. The community acquired a large opera house and new post office as well. The Northwestern Refining Company (Marathon Ashland Petroleum) came into the village about 1936 as a very small organization, building the first refinery in 1939. In the 1930s a sausage company opened in one of the old factory buildings. The early ferry that had carried folks across the Mississippi River from the foot of Broadway was replaced by the Rock Island (JAR) Swing Bridge in 1895. The bridge carried rail traffic on the upper deck and highway traffic on the lower. The railroad operated it as a toll bridge until 1938, when the state began renting the lower deck and tolls were dropped. It was closed to traffic after the 1963 Wakota freeway bridge was built between Newport and South St. Paul. St. Paul Park has grown slowly but steadily. In the 1980s 175 affordable homes were built in the Stevens Ridge Housing project in the southwest part of the city. In 2005 the city annexed land from Grey Cloud Island Township for a large development project that could possibly double its population. The Village of St. Paul Park was incorporated in 1909 and became a city in 1974. Today the City of St. Paul Park is a mostly residential community with somewhat more than 5,300 inhabitants in the 2000 census.